Careers for the Common Good are occupations that benefit the public good and are typically (but not always) part of the non-profit, public and/or government sector. These professions tend to have a socially responsible and civic awareness element either as part of the specific position or mission of the organization. 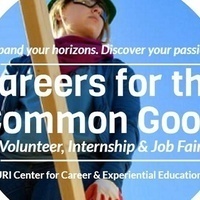 URI’s Careers for the Common Good (CCG) – Volunteer, Internship & Job Fair offers an opportunity for students to engage with organizations that serve the public good and are looking to recruit volunteers, interns, and employees that are interested in making a positive impact in, and are for the common good of, society. This fair is a great time to for Non Profit Agencies, Community Partners, Employers, and National Service Programs to educate URI students and recruit for new volunteers, interns, or employees. Attendees are welcome to visit with dozens of community agencies and learn how to become engaged in the community! Representatives will provide information about their organizations and a wide range of issue areas including: Environment, Education, Health, Safety, Political Engagement (including information on how to register to vote), National Service, Human Services, and more! This fair is being held in recognition of Constitution/Citizenship Day. Enacted in February 1952 by President Truman, this day encourages Americans to reaffirm our commitment as citizens of our country, and to reflect on the rights and responsibilities of citizenship. The choice of this date commemorates the events of September 17th, 1787 when the United States Constitution was signed. As part of this observance URI community members will also be provided resources and information related to the constitution, political engagement, and voting! Free for all! Agencies & Employers must register on www.rhodynet.uri.edu.